Art.nr:: 19025 Kategorier: BUICK, ENGELSKE HÅNDBØKER. Buick Electra ‘70 thru ‘84. Estate ‘70 thru ‘90. Le Sabre ‘70 thru ‘85. Limited ‘74 thru ‘79. 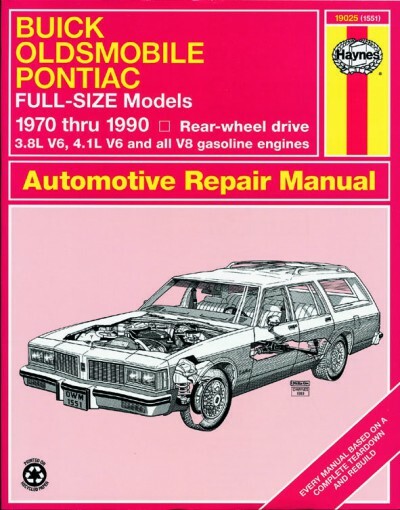 Oldsmobile Custom Cruiser ‘70 thru ‘90. Delta 88 ‘70 thru ‘85. Delta 88 Brougham ‘80 thru ‘85. Delta 88 Royale ‘70 thru ‘85. Ninety-eight Luxury ‘70 thru ‘81. Ninety-eight Regency ‘73 thru ‘81. Ninety-eight Regency Brougham ‘82 thru ‘84. Pontiac Bonneville ‘70 thru ‘81. Bonneville Brougham ‘70 thru ‘81. Catalina ‘70 thru ‘81. Grandville ‘70 thru ‘75. Parisienne ‘83 thru ‘86. Does not include diesel engine, front-wheel drive, turbo or 4.3L V6.